Russia's reliance on energy resources has been always a subject of hot debates. Some experts see the country's dependence from oil and gas as the “resource curse,” while others argue that energy sector may boost innovation breakthrough. Global demand for Russia’s mineral resources is huge. Exports of oil and oil products have risen from 120 million to 240 million tonnes in the past ten years - from $50 billion to $390 billion. But at the same time, demand for manufactured products and other industries drawing on Russian know-how has weakened. To some extent this is nothing surprising: as exports of commodities have grown, their role in the economy has increased too. But accepting this as the natural way of things is dangerous. Russia’s federal budget is reliant on commodities revenues - according to official data, commodities contribute around 60 percent of the federal budget; in reality, that number is closer to 75–80 percent as much of the service sector depends on money from oil and gas. We must make better use of the wealth our commodities have brought us. The issue is that we are wasting the money - spending it on non-productive services investments, for instance, rathert than invest it in the development of “real” economy sectors. This is because power in Russia is held by a commodity-based bureaucracy, totally reliant on oil and gas revenues. Some observers argue that developing the oil and gas industry will automatically lift other industry sectors. This is a gross exaggeration. Major companies such as Gazprom and Rosneft spend only sparingly on research and development – only around 1 percent of their annual revenues. This is not the kind of money that can spur the development of accompanying industries. What’s worse, we are often guilty of not trying to create something new ourselves. Instead, we prefer to buy from elsewhere. A government that genuinely understands development would know that change cannot come unaided. If we want to reduce the dominant role commodities play in the Russian economy we must adopt new policies and direct investment to sectors with the highest potential. I believe Russia has four areas where we could be global leaders. The first is energy, but instead of simply sending oil abroad we need to sell products made out of it. Second is applied mathematics, where we have a long-established reputation. Third is aerospace, and fourth is biotechnology. The essential step needed to drive these sectors forward is the introduction of tax breaks for innovative companies. Companies in the Skolkovo Innovation Center area just outside Moscow already benefit from this. Every entrepreneur in Russia whose activities fall within the scope of the law on innovation should have the same support, then in five years a good number of small businesses would grow into medium-sized enterprises, and we would have a strong inflow of foreign investment. Today, small businesses account for just 10 percent of GDP. By taking the right steps now, in ten years’ time our knowledge-based economy could account for 50 percent of federal revenues. This doesn’t mean that the oil and gas sector will shrink – only that revenues from other sectors will rise. Ivan Grachev is chairman of the Energy Committee in the State Duma. Reliance on natural resources as the principal source of its wealth does not necessarily result in a country falling prey to the “resource curse”. For decades, Norway, Canada and Australia have all combined abundant commodity production with democracy and shared prosperity. More recently, Chile has also demonstrated how a developing economy with abundant natural resources can develop into a stable democracy. Of course, economies that rely on minerals also see their fortunes rise and fall with commodity prices. But the peaks and troughs can be smoothed through the accumulation of relief funds and developing sophisticated financial markets. The oil sector in particular is also a potential source of high-tech development, capable of pulling other industries along with it. But if this can happen in the West, why is it not also taking place in Russia? The essential reasons are ownership and competition. Russia’s privately owned Novatek is far more efficient than state-run Gazprom. R&D investments in the monopolized gas industry lag far behind those of the far more competitive oil industry. Moreover, Russia is not alone in being a country where an abundance of resources discourages market reform and democratization. There is no denying that Russia relies heavily on oil, and any strategy for change will have to bear this in mind. 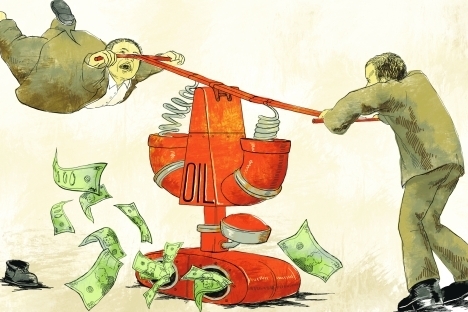 A 10 percent change in the price of oil results in a 1 percent fluctuation in GDP, more or less. And the state budget depends on oil prices. What can we do to reduce Russia’s dependence on oil and gas? Above all, we must think beyond this industry. We need to facilitate investment inflows in non-resource sectors. And this can be done by complying with President Putin’s decree of May 7, 2012 on long-term state economic policy. This document envisions privatization of all non-resource industries by 2016 - which by itself will improve Russia’s business climate. Some analysts have suggested this could move Russia up to number 50 in the World Bank’s Doing Business rankings from its current standing of 120, and add two points to Russia’s GDP growth rate, all from expansion in the non-resource sector. What about the other approach to diversification - building a top-down non-oil and gas production? Reliance on such a method would be misplaced. In his book, Boulevard of Broken Dreams, leading venture business researcher and Harvard Business School professor Joshua Lerner shows that even in America, with its professional and non-corrupt bureaucrats, such attempts failed. Of course, we shouldn’t think that the “resource curse” can be broken through a program of privatization alone. We must also take up the struggle against corruption and fight for the protection of property rights, demonopolization and economic deregulation. If we can break free from these traps, then one can expect growth and diversification, as well as transparency and accountability of the authorities. Sergei Guriev is Dean of the New Economic School in Moscow.